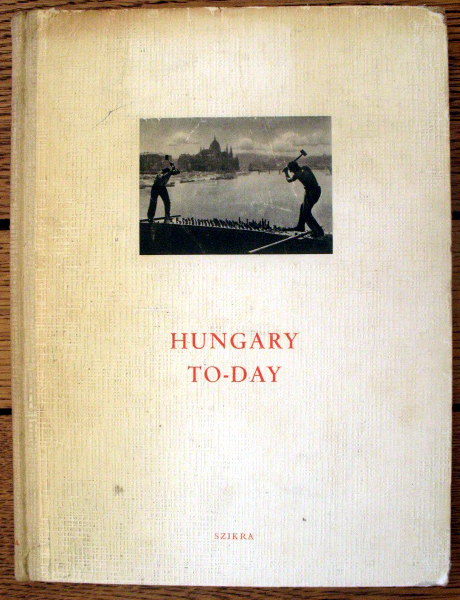 In the immediate aftermath of the Second World War, Hungary occupied an ambiguous place in the newly re-drawn boundaries of the Cold War. It had been an ally of Germany and fought against the Soviets, but now it found itself on the wrong side of the Iron Curtain, defeated and occupied by their enemies. Like Poland and Czechoslovakia, other countries the Western powers were keen to keep out of the Soviet orbit of control, Hungary was promised free elections to replace the dictatorial Horthy regime that had brought the country into the war. However, Stalin was keen to ensure that the elections produced the “right” outcome and despite getting only 17% of the 1945 vote, the Hungarian communist party assumed power (with the help of Soviet military intimidation to terrify its rivals). The next few years were spent consolidating its power and destroying its political rivals until the communists took full charge in 1949 and formed the People’s Republic of Hungary. Taking its cue from Stalin’s way of doing business, Mátyás Rákosi (the new thug in charge of the country) set about intimidating, torturing and murdering all potential rivals – the count is placed at about 350,000 victims. This Hungarian version of Stalinist-inspired terror went on for a number of years until his demise following Khrushchev’s denunciation of his predecessor in his ‘secret speech’ of 1956. But the brutal legacy of this failed attempt to impose control over the populace led directly to the 1956 Hungarian Uprising which, although suppressed with great ferocity, revealed the bankruptcy of a communist regime that needed to rely on Russian tanks to prevent its own people from stringing them up from the nearest lamppost. 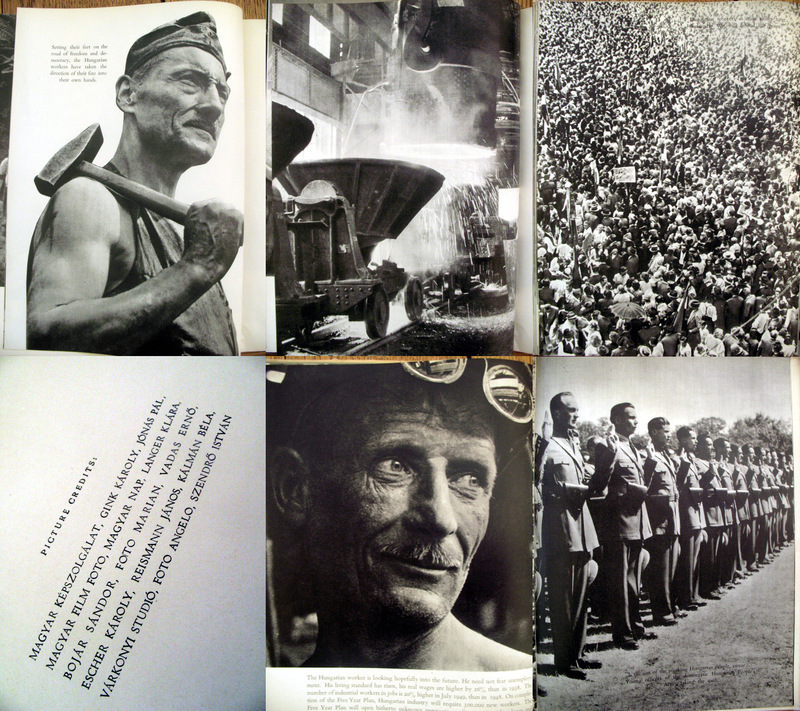 Printed in 1949 by Szikra, this is an English language celebratory photo album (French and German editions were also made) published in an attempt to whitewash the imposition of authoritarian rule and political violence for the outside world. As usual in such post-war publications, the narrative is fairly simplistic; back in the olden-days, under the autocratic big-wigs who ran the country to enrich the rich and powerful, times were tough. Things got so bad that they even managed to drag the country into a war on the wrong side. Luckily, the Soviets defeated the old dictatorship of Admiral Horthy and are just hanging around to help build a new, improved Hungary. Now, the new communist leadership is going to create a better future and a utopian society where everybody is going to be happy with their lot. And to prove this, here are photos of bountiful fields basking in the sunshine, people looking busy and smiling away inside gleaming factories, all looking forward to a brighter tomorrow. When it comes to the reconstruction section the device of contrasting the war damaged infrastructure with the newly rebuilt version (with Soviet help) is used as visual proof of the new regime’s success. As always in such propaganda publications, progress is presented as the inevitable way of solving all ills in order to create the ideal society as envisaged by the reigning sociopaths. 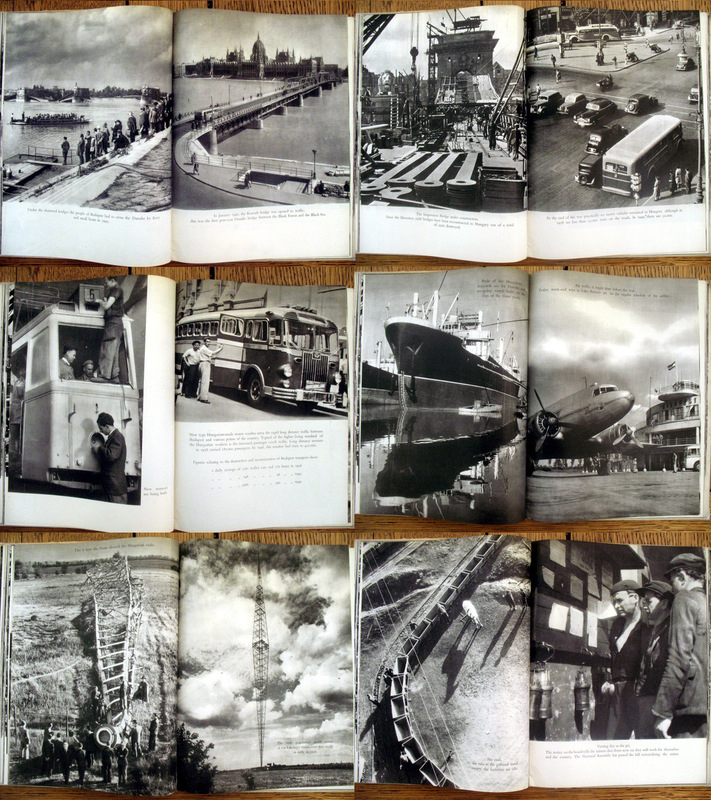 Design-wise, the book is fairly straightforward, with the black and white photographs printed full page throughout. 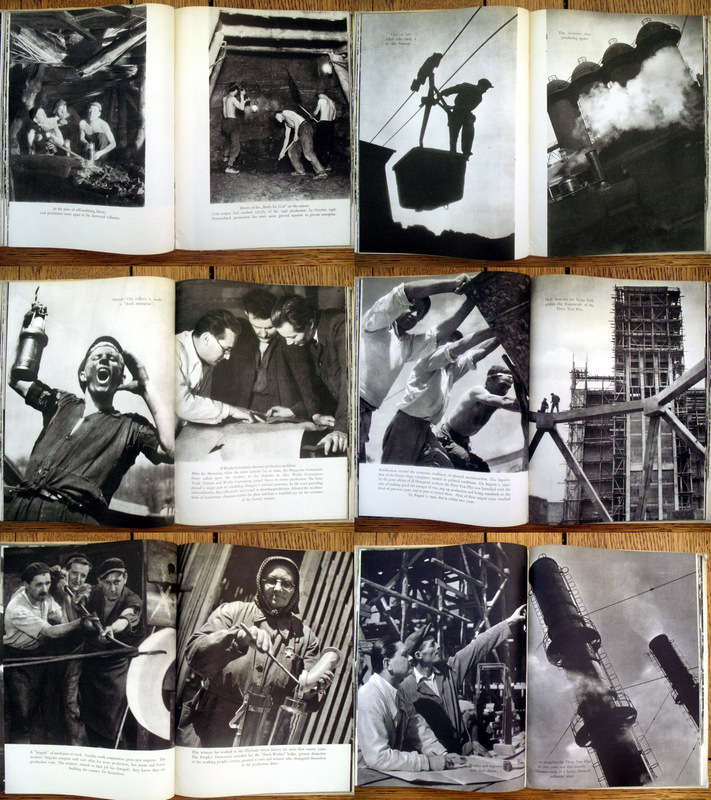 Photographically, there are some strong images in the book, particularly in the industrial section where there are a few nice modernist style photographs of chimneys and silos. A few dynamic images of individual workers also punctuate the section and move the narrative along. Unfortunately, the other sections are not as strong, filled with interesting (but not extraordinary) images that get the job done. 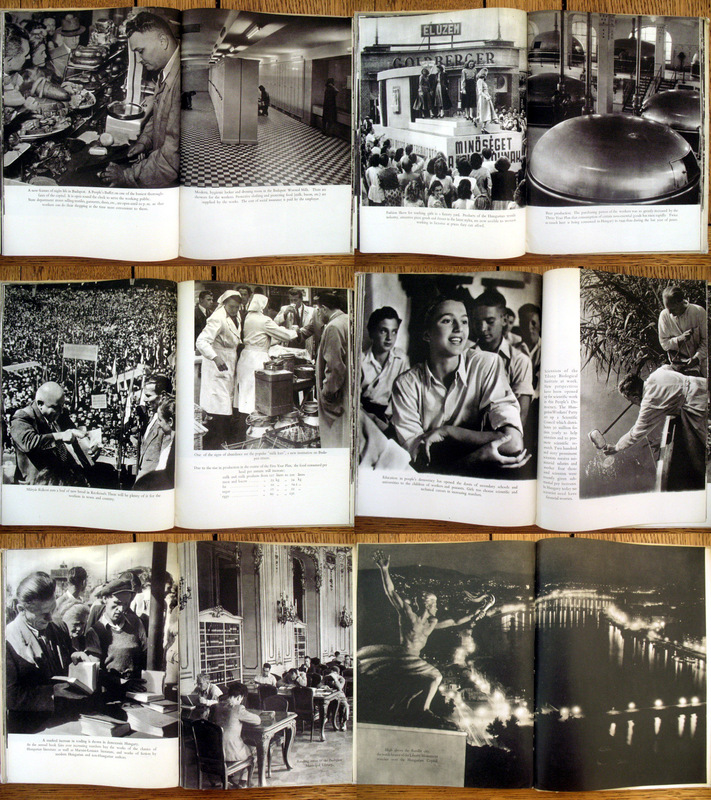 Although the photographers are listed at the end of the book, none of the individual images are credited to a particular maker. 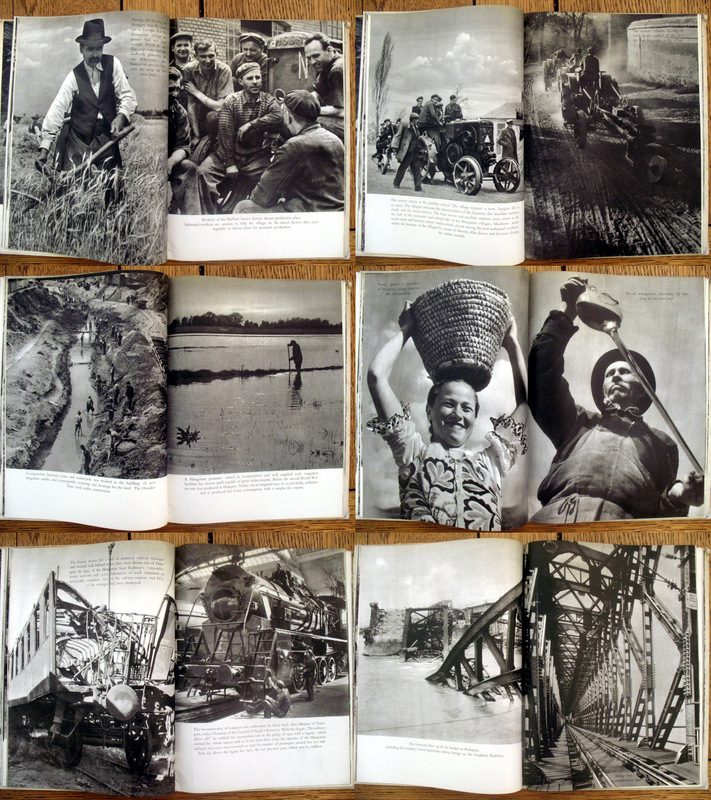 The book is divided into sections, each examining the particular social themes so beloved by communist propaganda makers (such as agriculture, industry, education, infrastructure, reconstruction, culture etc.) Interestingly, for what was to come, the military aspect is heavily downplayed. Usually such publications have a section about the glorious people’s army bristling with firepower ready to defend socialism to the last bullet…but here we get a single picture of a line up swearing allegiance to the new regime. In part, this reluctance may be due to Hungary’s recent position of being on the losing side during the war and a new found subservience to the Soviets. Whatever the reason, the militaristic overtones are heavily downplayed in favour of beauty-contest style platitudes about world peace. The narrative structure of the book makes it very clear who the communist regime owes its existence to; Stalin gets a full page portrait early on and then there is a image of a recently erected monument to the Soviet soldiers who took Budapest. Without Soviet support this regime is a non-runner. Usually, such pictorial books showcase the achievements of the new communist leaders, but in this case the cupboard is slightly bare. There are no real showcase grand projects or schemes that they can gloat about photographically. There is some mention about the achievements of the wonderful 3 year plan (which seem more than a bit dubious to me) and the regime appears to have organised other people to shovel the rubble off the streets, but apart from that it seems fairly thin. Even the language they use to describe this process (“stabilisation”) doesn’t exactly inspire confidence in their abilities to manage the future. 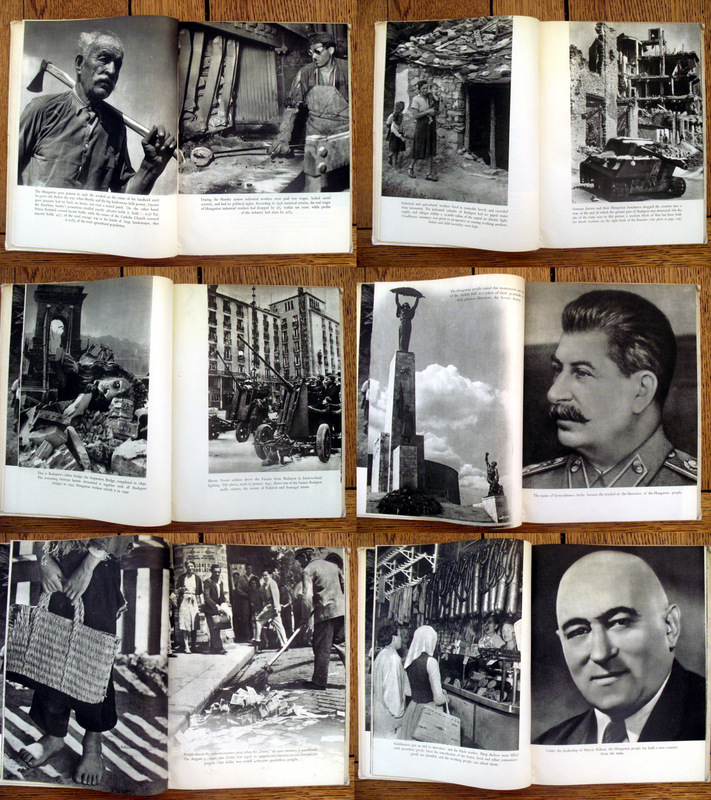 Instead, this book is more of a celebration by the communist leadership of their consolidation of power and providing lots of positive images to demonstrate that they had the support and backing of the population. The fact that a few years later there would be open revolt on the streets of Budapest using tanks and machine guns between those same people and the ruling regime shows that this premise was false.